Discussion in 'Hardgoods: Skis, Bindings, Poles, and More' started by Gerry Rhoades, Nov 9, 2015. Because any good ski forum needs a thread about quivers. Chriscray, fail to crush and Tricia like this. I love a good quiver thread! Have to get a picture of mine.....soon! Myles, fail to crush, Gerry Rhoades and 1 other person like this. My quiver is out in the garage crying because its so small. Doug Briggs, Dave Petersen and Chriscray like this. Will post a pic when I get home from...skiing. Chriscray, markojp, Jasmine and 1 other person like this. Well, hell. Says my photo is too big. I think 1 meg is the limit. Whoever bumped up the picture size, thanks. Here's the current quiver. 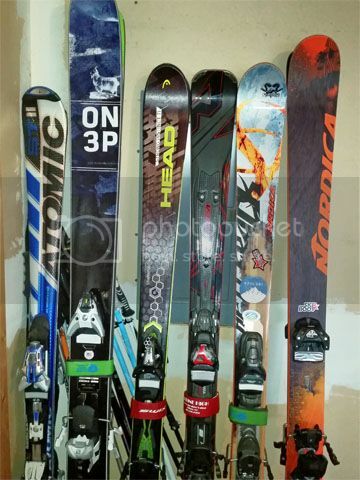 Volkl Racetiger WC SL, Kastle MX83, Old Bones, New Bones, Nordica Patron, K2 Coomback (backcountry set up). MountainMonster and Lorenzzo like this. Grass Sticks, Tricia and Gerry Rhoades like this. Did you try using the "Upload a File" button in the lower right part of the box where you type? Bill pointed that out to me and I had not even seen it. Are those Grass Sticks or Soul Poles? The Grass Sticks look much slicker than Soul Poles. dean_spirito, Grass Sticks and Ron like this. I am hoping to run into the GS folks at SIA, or while visiting Ron at the Boat, and sweet talk my way into the swappable basket mod, the big ol' baskets I have are pretty ungainly for other-than-pow. No sweet talk necessary. I just smiled, batted my eyelashes & dropped @Ron & @dean_spirito names. I think batting your eyelashes might qualify as sweet talk. Chriscray, Philpug, Monique and 3 others like this.